Lip augmentation, commonly referred to as lip fillers, is on the rise. Although they’re not for everyone, public curiosity has skyrocketed, making it one of the top-searched for cosmetic procedure on the web. 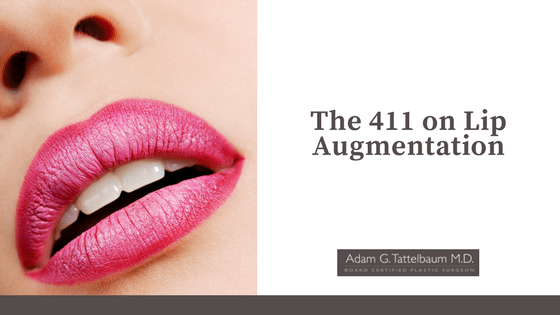 Whether you’re thinking about a little touch up, or a complete lip boost, this form of augmentation is quite effective and quick. In today’s modern world, lip fillers are now composed of hyaluronic acid, which is a naturally forming acid found in the body. It’s a highly effective and practical ingredient in cosmetics, and is not only used for lip augmentations. For example, you will find hyaluronic acid in many creams, as it helps efficiently hydrate and moisturize skin. Because HA is a substance that our bodies produce, it is easily accepted. With its natural components, the effects of fillers are not permanent. This is comforting for patients because you can easily test out a lip look and change it later if you’d like. Hyaluronic acid is also used for plumping out wrinkles, restoring volume to cheeks, and even removing the vertical lines on the sides of one’s mouth. In all aesthetic treatments, there is a chance that something may go wrong. It is important to ensure you’re getting a lip augmentation done by professionals. This means you shouldn’t have this procedure done at the beauty salon or spa. The main potential side effects of lip augmentation are bleeding from the injection sites, swelling, bruising, and some redness. For those who are vulnerable to cold sores, lip fillers may reactivate cold sores, or fever blisters, on the lips. Other potential side effects may include prolonged swelling, lumps or irregularities in the lips, infection, and allergic reactions. In order to know if lip augmentation is right for you, it is important that you have a valid reason for lip modification. If you undergo this procedure simply to make another person happy, or to fit an ideal image, then you should think twice. It is essential to also have realistic expectations and to consider that it will not drastically change your overall appearance or have a large impact on other features. It may not be ideal to undergo a lip augmentation if you have an active oral infection such as oral herpes. Also, if the patient suffers from diabetes, lupus or blood clotting issues, lip augmentation can be riskier and should be evaluated by a doctor. If you would like to learn more about lip augmentation, contact us now for a consultation.